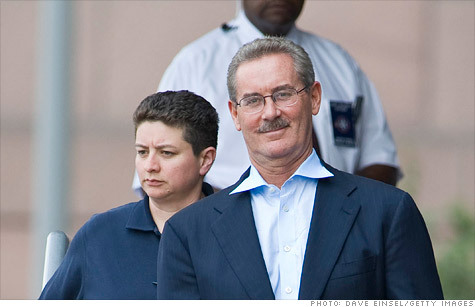 R. Allen Stanford in a 2009 file photo taken soon after federal financial fraud charges were brought against him. A jury convicted him on 13 of 14 counts Tuesday. NEW YORK (CNNMoney) -- A federal court jury in Houston found former financier R. Allen Stanford guilty Tuesday on 13 of 14 counts of running a Ponzi scheme. Stanford, who was first charged with the fraud by the Securities and Exchange Commission and federal prosecutors in 2009, was found guilty on 13 of 14 counts at the conclusion of a five-week trial. He could face up to 120 years in prison, according to his court-appointed attorney Robert Scardino. Federal prosecutors brought criminal charges against Stanford in June 2009. The only count he was found not guilty of on Tuesday was one count of wire fraud. Prosecutors have said that there are about 30,000 victims of the alleged fraud. "This trial will decide not just whether Stanford is guilty of the criminal charges, but also whether hundreds of millions of dollars of investor funds currently frozen may be forfeited and returned to his alleged victims," U.S. District Judge David Hittner wrote in a December court order. In February 2009 the SEC charged that Stanford and three of his companies orchestrated a $9.2 billion investment and sales fraud. But the SEC can only bring civil charges, not criminal charges. Prosecutors charged that Stanford sold billions of dollars in certificates of deposit administered by Stanford International Bank Ltd., an offshore bank in Antigua. The billionaire misrepresented to investors the financial condition of that bank, its investment strategy and the extent of regulatory oversight, the prosecutors said. Stanford also was accused of misusing most of those investments. Stanford maintained his innocence throughout the process. In a tearful 2009 interview, Stanford told ABC News: "I would die and go to hell if it's a Ponzi scheme." During the trial, Stanford did not testify in his own defense, even though his lawyers had suggested he would during opening statements. Margaret Finerty, a former New York criminal court judge who is now a partner at Getnick & Getnick in New York, said that likey hurt him. "It's always problematic when an attorney promises something that doesn't happen," she said. She said the prosecution's case was helped significantly by the testimony of Stanford's former chief financial officer James Davis. "You had someone who participated in the fraud to explain to the jury the significance of the documentary evidence," she said. "It wasn't only documents. He put it all together and brought it to life for the jurors." Testimony about Stanford's lavish lifestyle also helped to convince the jurors, she said. The jury got the case last Wednesday and Monday night sent a note to the judge saying they could not reach a unanimous verdict. But U.S. District Judge David Hittner sent them back for further deliberations and they returned with a verdict that was read in court just before noon local time Tuesday. "Last night when I heard there was a hung jury, I was spinning," said Stanford victim Cassie Wilkinson, speaking to reporters after the verdict. "I was so anxious, thinking what if this guy gets off? What if he actually walks after he took advantage of so many people?" Wilkinson said she and her husband were Houston natives who had retired to Austin, Texas, before losing much of their savings in investments with Stanford. Her husband has had to return to work and Wilkinson said she might have to return to work as well. After sitting through five weeks of the trial, she said she welled up in tears when the verdict was announced. "There is a little bit of vindication knowing that there are 12 other people who thought the same thing, that we were just scammed," she said. "There's a sense of relief we're not just fools."